We've lusciously blended Organic raspberry leaf and elderflower to our award winning Kombucha. Enjoy its subtle, well-balanced flavour. It will leave you feeling refreshed, light and energised. British, 100% Organic, natural Kombucha made using traditional craft methods and ethically sourced ingredients. Great Taste Award 2017. Kombucha is a fermented green tea sparkling soft drink full of naturally occurring acids, vitamins and enzymes. Which promote healthy digestion and gives a natural energy boost to your day. Suitable for Vegans. Please don't shake. 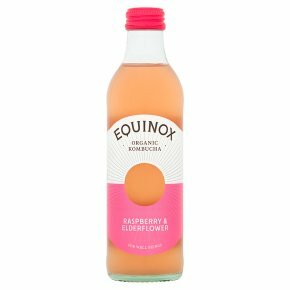 Equinox Kombucha is raw, organic, unpasteurised and alive!